They are fun to receive, sometimes stressful to send (who did I forget) and easy to recycle. 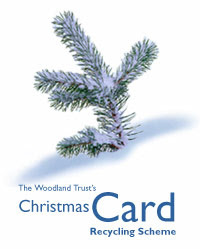 If you have a heap of Christmas cards at home, or in the office, don’t bin them, take advantage of the Woodland Trust recycling scheme until January 31st 2008. You can drop them off at WHSmith stores, TESCO supermarkets, TK Maxx stores or M&S and by doing that you will help them reach their target of recycling 100 million cards. The money that the Woodland Trust raises from the recycling will allow them to plant 24,000 trees in the UK. So, turn your card back into a tree, de-clutter your house and make yourself feel good about all that paper which came through your letterbox in December.